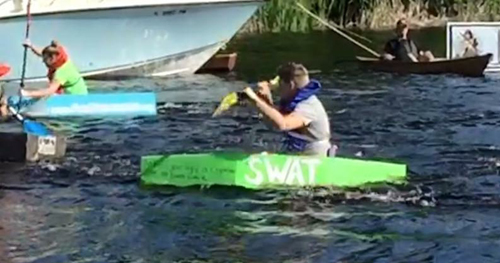 On October 3rd 2015, Yearling Middle School SWAT Club participated in the 5th Annual Adam Bryant Minimal Regatta. The regatta is a homemade boat race where all the boats are constructed of the same minimal supplies and then compete in the water. 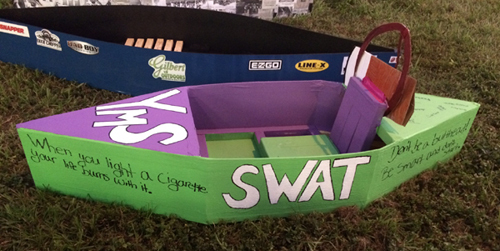 The Yearling Middle School SWAT club spent several weekends building their boat and painted anti-tobacco messages on the side of the boat. The captain of the boat was Dustin Lowe and he navigated his way to a third place victory in the “first mate” race class. The SWAT clubs are for open to Okeechobee youth ages 10-19. For more information about joining a club please contact Courtney Moyett at 863-801-8277.